In the waning days of the Ottoman Empire, with defeat at the hands of the Allies all but assured in the Great War, Turkish authorities began rounding up the Empire’s Armenian population for systematic extermination. More than a century removed, Ankara’s official position remains one of abject denial. “It’s one of the most repressed events of the 20th century, and so one of the functions of the film is educational,” said filmmaker Terry George, whose genocide drama “The Promise” opens in the District this weekend. “The Promise” opens in Istanbul 1915, where Armenian medical student Mikael Boghosian(Oscar Isaacs) falls for Ana (Charlotte Le Bon), despite his being promised to another Armenian from his village. Ana, meanwhile is in Turkey on the arm of Chris Myers (Christian Bale), an American reporter whose reporting about the genocide will soon make him a target of Turkish authorities. Although connected politically, soon enough Mikael’s allies are unable to save him from the fate of his people, and he is sent to a forced labor camp. Mr. George, who previously wrote the Rwandan genocide film “Hotel Rwanda,” said the subject of man’s inhumanity to man has continued to draw him. And one that seemingly cannot escape politics. 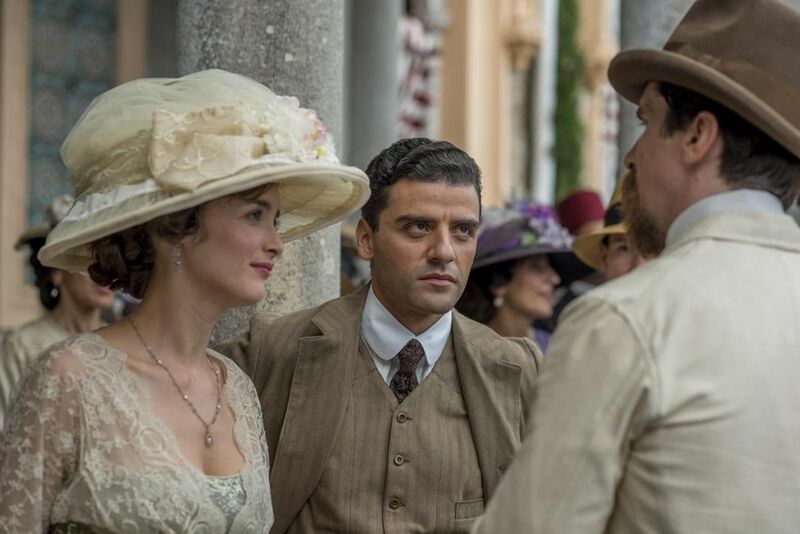 “The Promise” premiered at the Toronto International Film Festival (TIFF) last September, but before the end credits had even finished rolling, there were thousands of negative reviews posted to the IMDB. Mr. George minces no words as to who was likely responsible. “The Promise” was shot on location in Portugal, Spain and Malta. It was key, Mr. George said, for this to lend his film an air of authenticity, especially the death marches when Ottomon soldiers were marching Armenians through the deserts — most of them to their deaths. A crucial plot turn later in the film has Mikael leading a desperate run with his people to the Meditteran Sea, where he hopes to be rescued by French naval forces. This was based on an actual event, Mr. George explained. Such sentiments were echoed by Eric Esrailian, one of the film’s producers and a professor of medicine at UCLA in Los Angeles. “The main purpose of the film is to educate people and move them, and then hope that it builds up a momentum,” said Mr. George. “Never forget,” added Mr. Esrailian. There were audible gasps in the theater when one of the characters made a reference to being relocated to Aleppo. So, tell me how what the film ties into what is going on in the world today. TS: The film is a love story set in the first World War in Turkey at the beginning of and through the process of the Armenian genocide and a key part of the Turkish plan for the Armenians was to drive them from basically the Northern Turkey south across the deserts towards the area of Aleppo, basically the same area that we know today for the huge conflict between the Syrian rebels, Isis, and the Syrian government. What we re-created in the film were scenes that are so reminiscent of today, are so parallel to today, with huge numbers of refugees fleeing across borders under siege on a mountain. It is remarkably similar to what happened in northern Iraq and then people drowning in the Mediterranean Sea just as they are today. I think the dissimilarity is the reaction to refugees back then as compared to today in that the Armenians managed to escape and find refuge in France, in America, across Europe. They were treated as refugees whereas today as we know there is a growing movement against these people who can’t be blamed for their situation and need to be treated with humanity and tolerance. You point out at the end of the film that the Turks still officially deny that this happened. Is that why it is not better known? TG: For sure. I mean at the time of the event it was probably the most covered and publicized event of the first World War in the United States. There were reports every day from Christian ministries in Turkey and from news reports and New York Times at the time and various papers is covered it fastidiously and then after the breakup of the Armenian Empire and the division of the Armenian Empire among the British and French and so forth and the foundation of the Turkish state, the Turkish government, successive Turkish governments began a campaign of disinformation and denial that is still going on to this day. So the information was withheld or actively suppressed and while you had after the Holocaust Nuremberg Trials and so forth there were attempts initially at the end of the war to have trials by the British and I think some of the genocide perpetrators were hung. But in the end because of the desire by mainly the French and British to divide up the Armenian Empire the trials fell to the wayside and no one was held responsible for what took place. EE: I think also Terry deserves a lot of credit because if it wasn’t for Terry’s film “Hotel Rwanda” I don’t think Rwanda would be as well understood or at least the awareness would be diminished so that kind of goes back to what Terry always has said: making a film has a sense of permanence and if it resonates with people then they’re not going to forget it. That was a big part of the mission of making the movie. TG: The genocide is a scar on the Armenian nation that it’s almost impossible to get past. EE: That speaks to the success of the Turkish government in repressing this. I always make the analogy that it’s like the Irish famine, the famine is burnt in the soul of all Irish people and this is very similar to it but given the politics of that region at the moment and how volatile it is an understanding of what took place and some sort of reconciliation and reparation to the Armenians could go a long way to stabilizing at least the northern part of that region. And there’s a second thing that needs to be remembered, genocide is the word that was invented to describe what happened to Armenians by Raphael Lemkin. This is probably the highest form of crime. If you’re going to codify that then the first great genocide in the 20th century needs to be recognized by everyone as such. I think they're following me. 18 course omakase at Oya in Manhattan!!! At about 9:30, I get this. Madrid is beautiful. Off scouting locations today near Valencia. Cool train from Madrid. Here's a nice article from Yahoo! movies on my work in A Most Violent Year.